Meanwhile, Back in America . . . The State of the Union was a spectacle of delusion and self-congratulation in which a Congress nobody likes rose to cheer a president nobody really likes. It marked the continued degeneration of a great and useful tradition. Viewership was down, to the lowest level since 2000. This year’s innovation was the Parade of Hacks. It used to be the networks only showed the president walking down the aisle after his presence was dramatically announced. Now every cabinet-level officeholder marches in, shaking hands and high-fiving with breathless congressmen. And why not? No matter how bland and banal they may look, they do have the power to destroy your life—to declare the house you just built as in violation of EPA wetland regulations, to pull your kid’s school placement, to define your medical coverage out of existence. So by all means attention must be paid and faces seen. I watched at home and thought: They hate it. They being the people, whom we’re now supposed to refer to as the folks. But you look at the polls at how people view Washington—one, in October, had almost 9 in 10 disapproving—and you watch a kabuki-like event like this and you know the distance, the psychic, emotional and experiential distance, between Washington and America, between the people and their federal government, is not only real but, actually, carries dangers. History will make more of the distance than we do. Someday in the future we will see it most vividly when a truly bad thing happens and the people suddenly need to trust what Washington says, and will not, to everyone’s loss. In the country, the president’s popularity is underwater. In the District of Columbia itself, as Gallup notes, it’s at 81%. The Washington area is now the wealthiest in the nation. No matter how bad the hinterlands do, it’s good for government and those who live off it. The country is well aware. It is no accident that in the national imagination Washington is the shallow and corrupt capital in “The Hunger Games,” the celebrity-clogged White House Correspondents’ Dinner, “Scandal” and the green room at MSNBC. It is the chattering capital of a nation it less represents than dominates. Supposedly people feel great rage about this, and I imagine many do. But the other night I wondered if what they’re feeling isn’t something else. As the president made his jaunty claims and the senators and congressmen responded semirapturously I kept thinking of four words: Meanwhile, back in America . . . Meanwhile, back in America, the Little Sisters of the Poor were preparing their legal briefs. 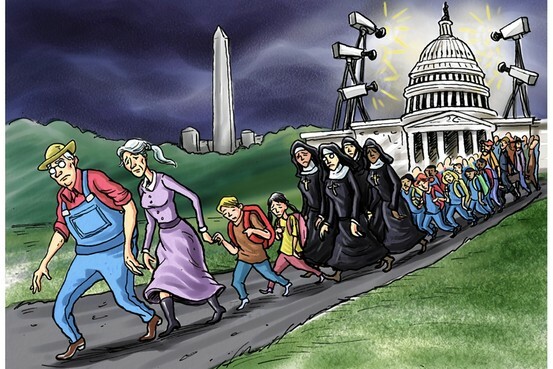 The Roman Catholic order of nuns first came to America in 1868 and were welcomed in every city they entered. They now run about 30 homes for the needy across the country. They have, quite cruelly, been told they must comply with the ObamaCare mandate that all insurance coverage include contraceptives, sterilization procedures, morning-after pills. If they don’t—and of course they can’t, being Catholic, and nuns—they will face ruinous fines. The Supreme Court kindly granted them a temporary stay, but their case soon goes to court. The Justice Department brief, which reads like it was written by someone who just saw “Philomena,” suggests the nuns are being ignorant and balky, all they have to do is sign a little, meaningless form and the problem will go away. The sisters don’t see the form as meaningless; they know it’s not. And so they fight, in a suit along with almost 500 Catholic nonprofit groups. Everyone who says that would never have happened in the past is correct. It never, ever would have under normal American political leadership, Republican or Democratic. No one would’ve defied religious liberty like this.The president has taken to saying he isn’t ideological but this mandate—his mandate—is purely ideological. It also is a violation of traditional civic courtesy, sympathy and spaciousness. The state doesn’t tell serious religious groups to do it their way or they’ll be ruined. You don’t make the Little Sisters bow down to you. This is the great political failure of progressivism: They always go too far. They always try to rub your face in it. Meanwhile, back in America, disadvantaged parents in Louisiana—people who could never afford to live in places like McLean, Va., or Chevy Chase, Md.—continue to wait to see what will happen with the state’s successful school voucher program. It lets poor kids get out of failed public schools and go to private schools on state scholarships. What a great thing. But the Obama Justice Department filed suit in August: The voucher system might violate civil rights law by worsening racial imbalance in the public schools. Gov. Bobby Jindal, and the parents, said nonsense, the scholarship students are predominately black, they have civil rights too. Is it possible the Justice Department has taken its action because a major benefactor of the president’s party is the teachers unions, which do not like vouchers because their existence suggests real failures in the public schools they run? Meanwhile, back in America, conservatives targeted and harassed by the Internal Revenue Service still await answers on their years-long requests for tax exempt status. When news of the IRS targeting broke last spring, agency officials lied about it, and one took the Fifth. The president said he was outraged, had no idea, read about it in the papers, boy was he going to get to the bottom of it. An investigation was announced but somehow never quite materialized. Victims of the targeting waited to be contacted by the FBI to be asked about their experience. Now the Justice Department has made clear its investigation won’t be spearheaded by the FBI but by a department lawyer who is a campaign contributor to the president and the Democratic Party. Sometimes you feel they are just laughing at you, and going too far. In the past five years many Americans have come to understand that an agency that maintained a pretty impressive record for a very long time has been turned, at least in part, into a political operation. Now the IRS has proposed new and tougher rules for grassroots groups. Cleta Mitchell, longtime attorney for many who’ve been targeted, says the IRS is no longer used in line with its mission: “They’re supposed to be collecting revenues, not snooping and trampling on the First Amendment rights of the citizens. We are not subjects of a king, we are permitted to engage in First Amendment activities without reporting those activities to the IRS.”All these things—the pushing around of nuns, the limiting of freedoms that were helping kids get a start in life, the targeting of conservative groups—all these things have the effect of breaking bonds of trust between government and the people. They make citizens see Washington as an alien and hostile power. Washington sees the disaffection. They read the polls, they know. They call it rage. But it feels more like grief. Like the loss of something you never thought you’d lose, your sense of your country and your place in it, your rights in it.